If you like both contemporary and Caribbean styles, you’ll love the beautiful browns, blues and whites at Seabird Villa. This villa is both soothing and classy, with a modern kitchen and living area, four poolside bedrooms, and a comfy lounging veranda. You’ll have nonstop views of Rendezvous Bay Beach, the Caribbean Sea, and the mountains of St. Martin. The only thing to be careful of is bringing young children, since each bedroom opens to the pool. 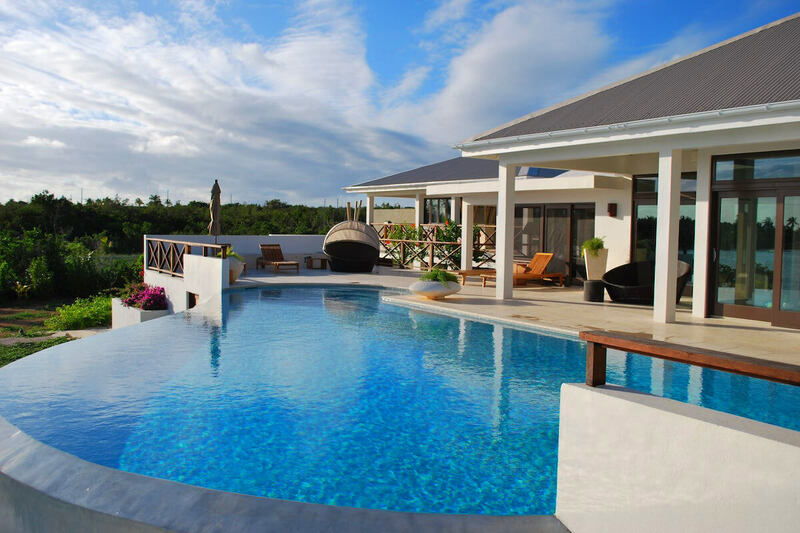 Seabird Villa is a four-bedroom home that blends contemporary style with classically Caribbean architecture. Expansive windows, an infinity-edge pool, and a terrace face panoramic views of Rendezvous Bay Beach, the Caribbean Sea, and the mountains of St. Martin beyond. Sliding glass doors lead from the living area to the spacious pool deck. There are plenty of loungers and secluded areas to relax, unwind, and sunbathe in. There’s daybeds, umbrellas, and adirondack chairs bordering the freeform infinity pool, which pours into a waterfall on the lower level. The comfortable screened porch offers respite from the elements without sacrificing views, and is furnished with a sectional, a dining table, and an armchair. On the lower level, there’s a large sitting area amidst manicured gardens. This gated estate is fully air-conditioned and has WiFi throughout. The living area has a large flatscreen TV, proximity to the dining room and kitchen, and access to the pool deck. There are several other sitting areas throughout the interior, and the kitchen and dining room take up most of the main level. The open, modern kitchen is furnished with stainless steel appliances, a breakfast bar, and exterior access. A laundry room and storage area are available on the lower level, and a study is in the East Wing. The villa features four spacious bedrooms that each offer an ensuite bathroom and terrace/balcony access. The Master Suite is located in the East Wing and has a king bed and bay views. The bathroom has a shower with natural stone tiles, and the bedroom has a ceiling fan and a large flatscreen TV. The West Wing’s upper level holds two guest bedrooms: one has a queen bed and the other has two twin beds that can be converted into a king. The West Wing’s lower level features an additional suite with a queen bed and a garden-level patio. It is recommend that young children be properly accompanied, as all four bedrooms open onto decks or balconies that lead to the pool. This private gated estate is less than five minutes from Rendezvous Bay, one of Anguilla’s most beautiful beaches. Daily housekeeping maintains the villa. A five minute's walk to the powder white sands of Rendezvous Bay. Upon arrival guests will secure a rental car or taxi and drive to the villa using the directions provided.